Situated midway along the west coast of Peninsular Malaysia, Kuala Lumpur is definitely the focal point of the "new Malaysia." 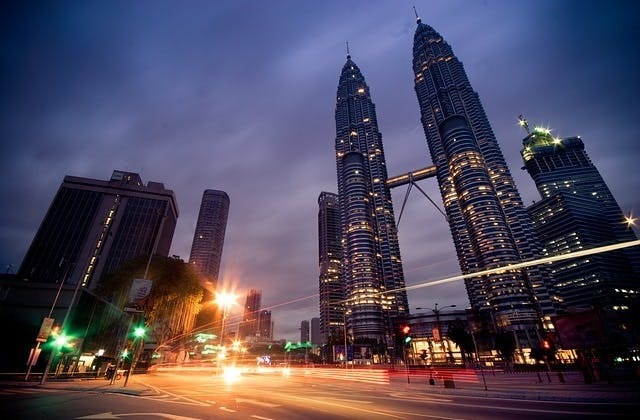 The city brings together both past and present Malaysia allowing first-time visitors to see Malaysia as a whole before venturing off to explore all the separate, unique areas. As the entry point for most visitors as well as the meeting point for the country's many attractions, Kuala Lumpur a truly a grand gateway to one of the more fascinating destination getaways to travel to. Spend your days exploring the market places, museums and botanical gardens. End your evening with a delightful dinner far above the city in the Seri Angkasa Revolving Restaurant. Don't forget to see the Petronas Towers. At a height of 1,453 ft, they have become symbols for the astounding growth that had taken place there in the last two decades. To Kuala Lumpur, the longest flight is 2194 hours and 15 minutes flying Cathay Pacific Airways, going through Hong Kong, Kuala Lumpur. KLIA is the nearest train station to Kuala Lumpur airport. 65 airlines operate into Kuala Lumpur. This includes Malaysia Airlines, AirAsia, Royal Nepal Airlines, Qatar Airways, Garuda Indonesia, Austrian, Lion Airlines plus more.